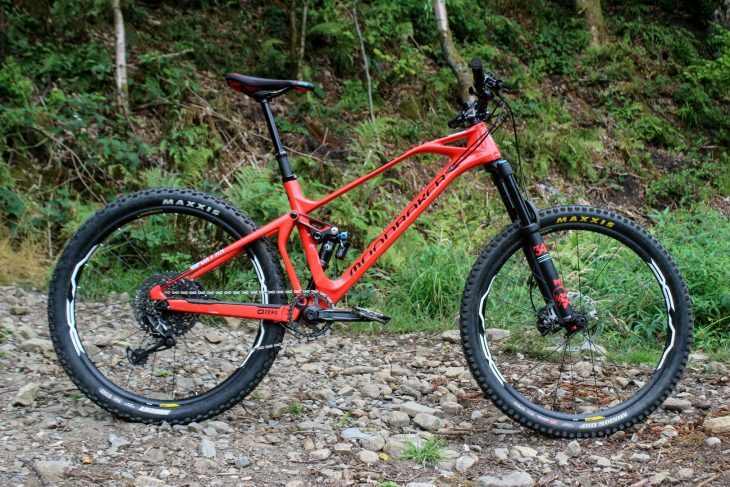 Look at any press release for a new bike and chances are that the bike company will shout from the rooftops are that they’ve gone longer, lower and slacker, but it was Mondraker that did it first. Over the past five months, I’ve been riding this carbon Foxy RR which sits in the Enduro/AM segment of the Mondraker lineup but isn’t marketed as its full-on enduro bike, (Mondraker recommends the Dune instead). Rest assured though, this 150mm Spaniard will happily devour whatever you wish to throw at it. 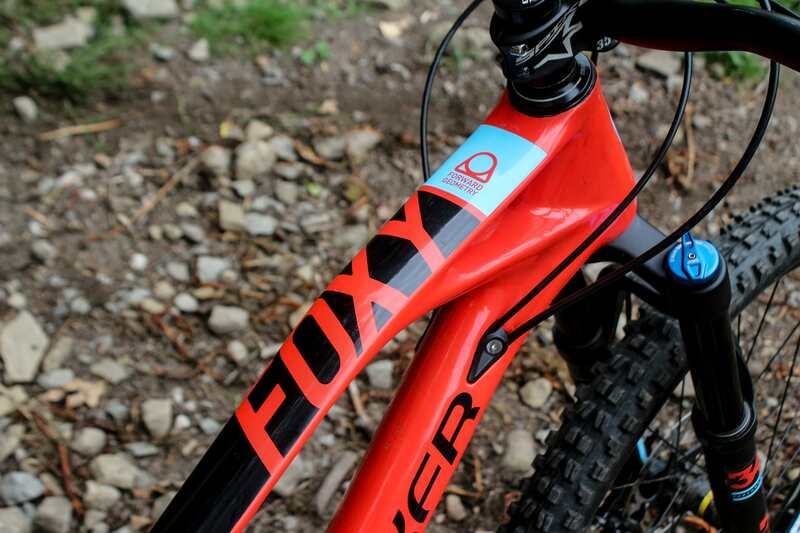 At £4,499, the Foxy RR is quite a spendy bike, but it’s actually only the 2nd bike in the Foxy Range. 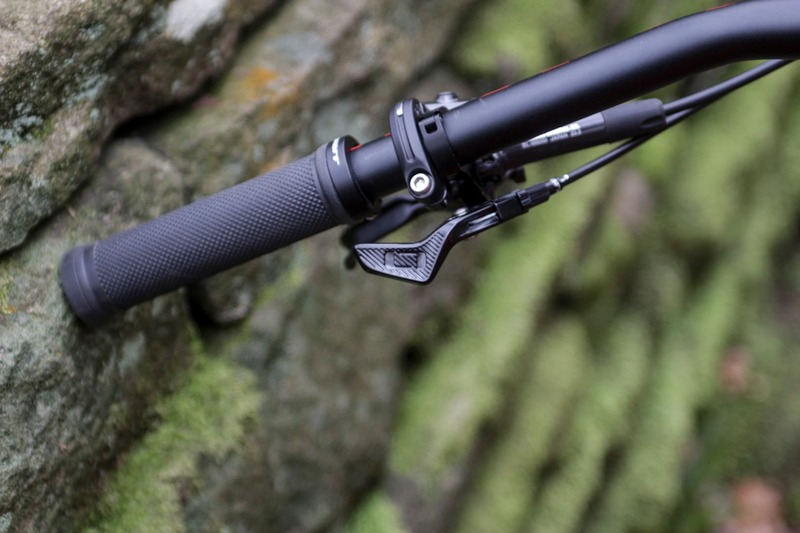 A more affordable Foxy Carbon R with RockShox Revelation fork is available at £3,799 while the top of the range Foxy RR SL brimming with top of the line kit can be had for £7,699. Mondraker calls its long, low and slack geometry “Forward Geometry” and it is radically different from most other “off the peg” bikes on the market today. 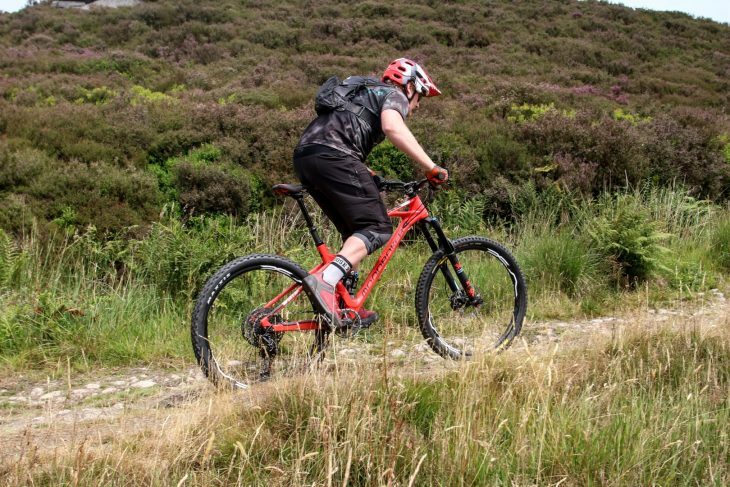 This size medium Foxy RR boasts a reach of 480mm which is longer than most large bikes on sale, while the XL frame jumps to a whopping 520mm reach. 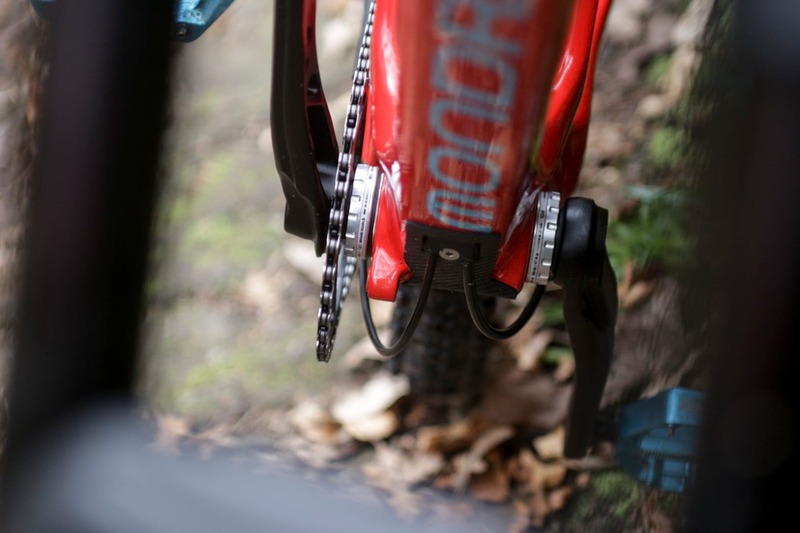 The rest of the numbers are all bang on for a modern trail bike including the 66º head angle, 75º seat tube, and short 420mm seat tube, allowing riders the option to size up. 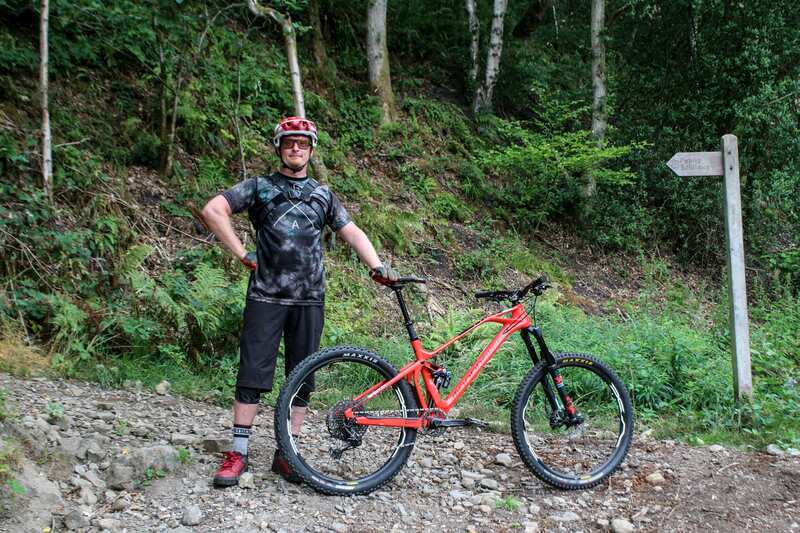 After riding plenty of bikes over the past few years with more conservative geometry figures, I was eager to test the Foxy and see if longer really is better, and with this in mind, I tested the bike on local trails plus natural, rock-strewn trails in the South of Spain. It’s clear that a sizeable amount of the cost of the Foxy RR has gone into the frame. The beautifully designed carbon bike has an organic look to it with flowing lines and aggressive angles that make the bike look like it’s travelling at speed even when it’s sat completely still. Stealth construction for weight saving and added comfort. 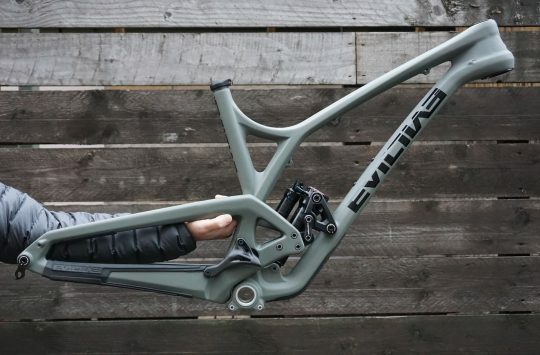 Mondraker’s carbon Forward Geometry bikes use what the company calls Stealth Carbon construction, a constantly developing technology that ensures that bikes are built based on their intended use and that they all features specific traits. So while a Foxy and a Dune appear similar in design, they won’t necessarily feature the same construction and will use specific carbon layups to ensure that they offer strength where it’s needed. Along with strength, Mondraker’s Stealth Carbon has been designed to offer structural rigidity and trail absorption while remaining light. Carbon fibre is used for both the front and rear triangles with alloy CSC rockers connecting the two together, the lower link is a fully CNC machined alloy job while the upper link gains a carbon bridge to reduce weight further. To keep with the ‘stealth’ theme, the Foxy has internal cable routing with a handy access window on the downtube near to the BB to aid routing. Hoses and cables enter the carbon frame via specific plastic cable ports that hold them still to prevent unwanted noise or rattle. More neat features on the frame include a mudguard for the rear shock, custom chainstay protector, a tapered head tube and best of all a threaded bottom bracket! The Foxy’s ZERO suspension system rotates on Enduro MAX sealed bearings which are considered some of the best in the business and should maker for fewer service internals. The suspension platform uses a floating shock design. What this means is the shock is mounted on the upper and lower links rather than to the mainframe, so the shock actually moves position through compression. Merida, Pace and Trek have also used similar floating shock designs too. 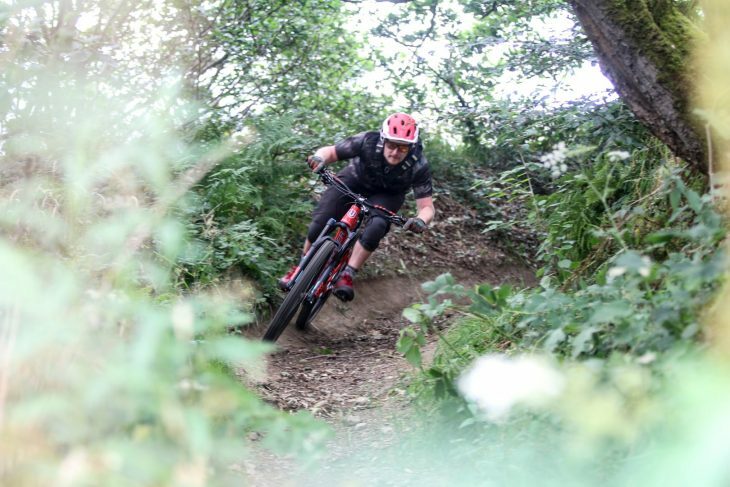 150mm of rear wheel travel is controlled by a Fox Float DPX2 EVOL rear shock. This air shock has a trunnion top mount and adjustment for rebound, compression and air pressure. 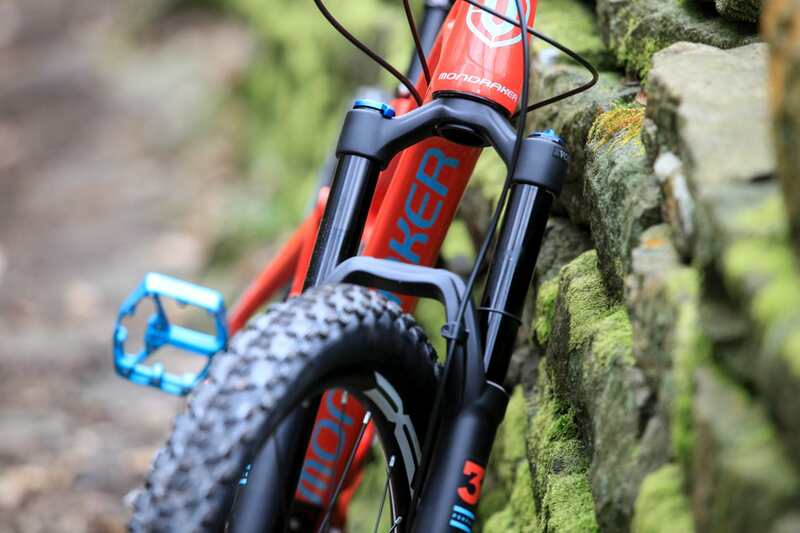 It’s worth noting that while this shock compliments the suspension system of the Foxy, the elegant Mondraker design does make setting rear sag up a pain in the arse. We’d love to a sag gauge implemented to aid this on future models. The DPX2 has 3 compression settings, but I only ever needed to use the middle setting for road climbs and then flicked it to fully open even when climbing off road. I tested the Foxy with the Fox 34 and a Fox 36. The bigger fork suits the bike’s wild side better. 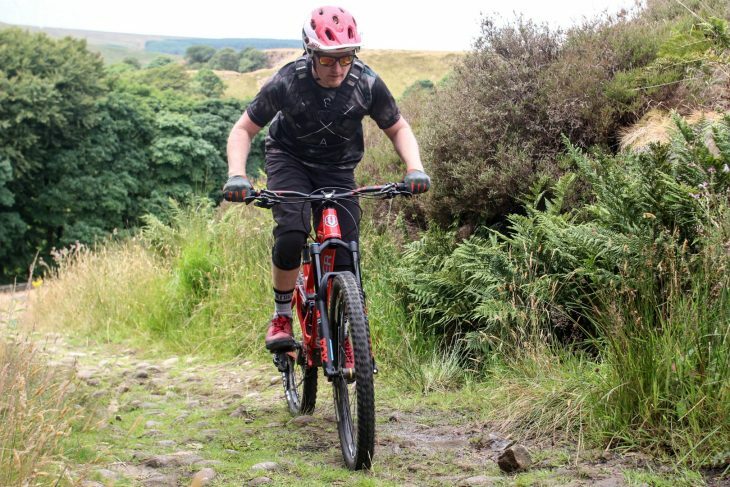 Matching the 150mm of rear wheel travel is a 150mm travel Fox 34 Float Grip Performance EVOL fork, again with rebound, air and settings for compression. The 34 Grip Performance is a good mid-range fork, that can handle some harsh riding, but a 36 would suit the bike better. For the build, Mondraker has used a collection of parts from Onoff, a brand that I wasn’t too familiar with until the Foxy arrived, and after using their stem and grips I can safely say I won’t be using them again. 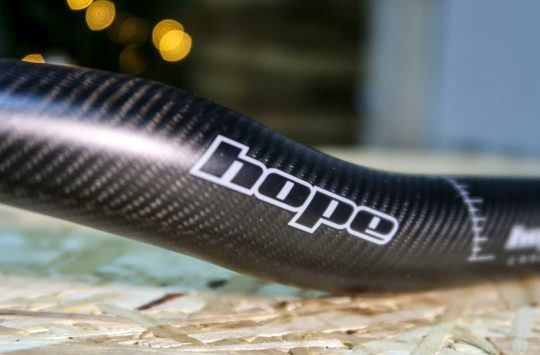 Onoff stem didn’t clamp correctly on our test bike. To match the Forward Geometry of the Foxy, Mondraker specs a 30mm Onoff Stoic stem, and while I loved the length I didn’t really like the fact it kept letting go of the steerer. This became especially worrying while dropping into a steep chute only for the forks to twist, throwing myself over the bars. No amount of tightening could get the stem to stay still so I was forced to switch to a Spank Spike Race stem that I had reviewed last year. I had a similar problem with Onoff branded Diamond grips which would slip unless really tightened to the max, a real shame as they are quite comfortable. Onoff grips are comfortable. Onoff dropper uses a 1x cable remote. Another Onoff branded product is the Pija dropper post. This cable operated dropper actually performed really well, however it has a drop of just 125mm on my medium test bike (L, XL also get a 125mm drop while small size frames have a 100mm drop post), which isn’t anywhere near enough for a bike of this calibre. I eventually swapped to the SDG Tellis dropper with 150mm of drop, but 170mm might be necessary for some riders. The Foxy arrived with tyres on the wrong way, with the rear tyre on the front and vice versa. Mavic XA wheels are tubeless compatible but ship with tubes. The wheels are built up with just 24 straight pull spokes on rims with an internal width of only 25mm. 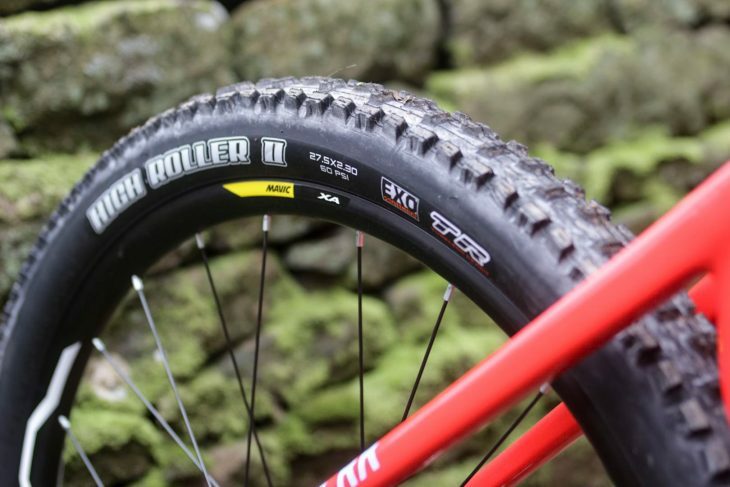 Not really the type of wheelset we would expect to see on a bike with so much potential. Oddly our test bike came with a Maxxis Ardent set up on the front and a High Roller on the rear. We confirmed from the Mondraker website that this wasn’t what the Spanish brand intend so we swapped them around. The 780mm Mondraker branded bar is super comfy. 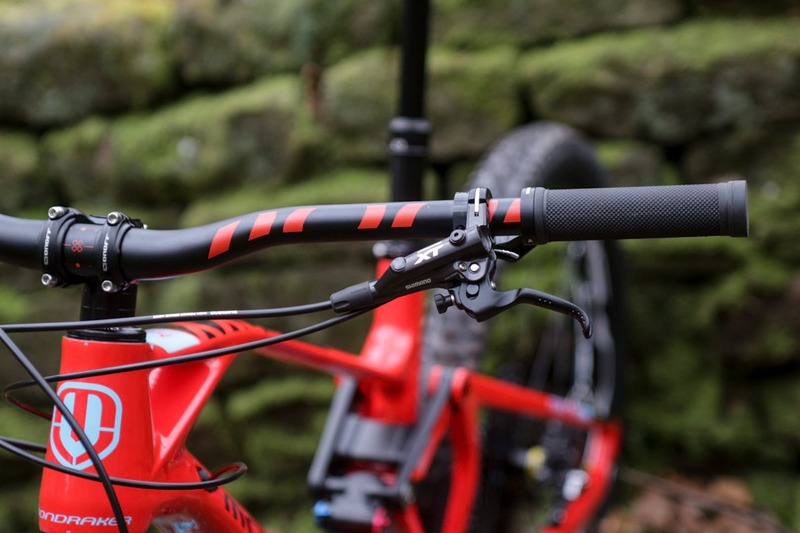 The Mondraker branded 780mm wide bar is as good as a bar can be. The 9º back sweep and 5º up suit me just fine. They’re wonderfully comfortable, not too stiff and don’t transfer trail buzz back to your wrists. 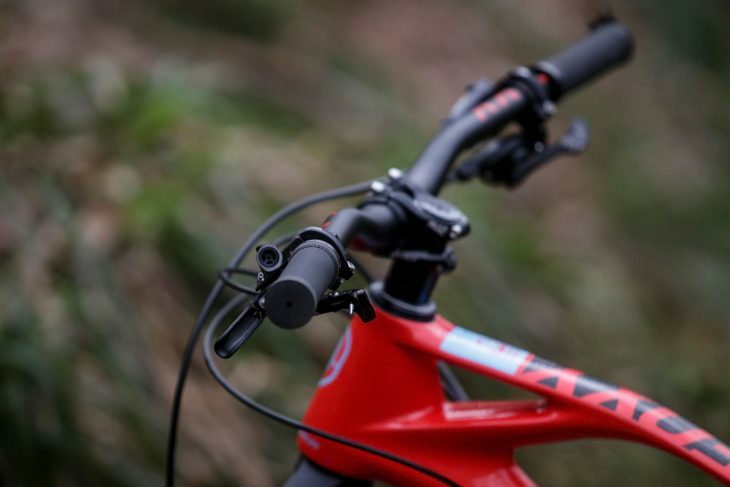 Mondraker handlebars = good. Shimano XT brakes are a really good spec choice. 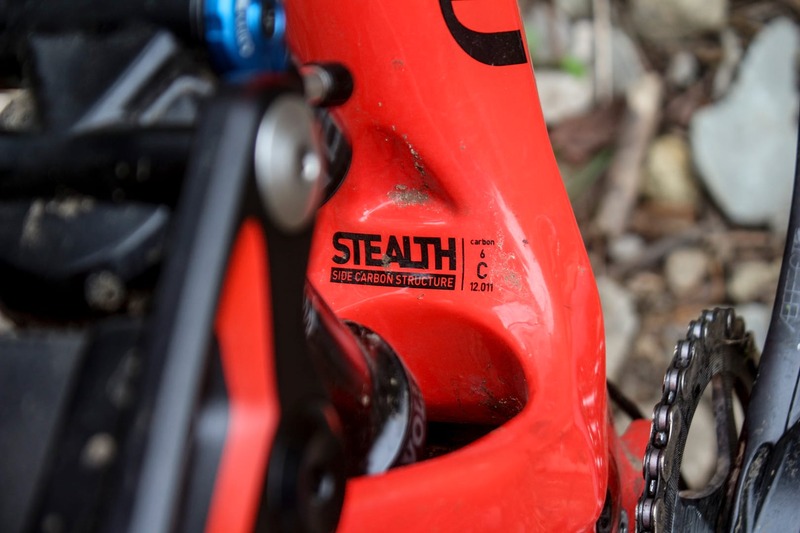 I’m also really happy to see Shimano XT brakes on a bike that features an SRAM GX Eagle drivetrain. 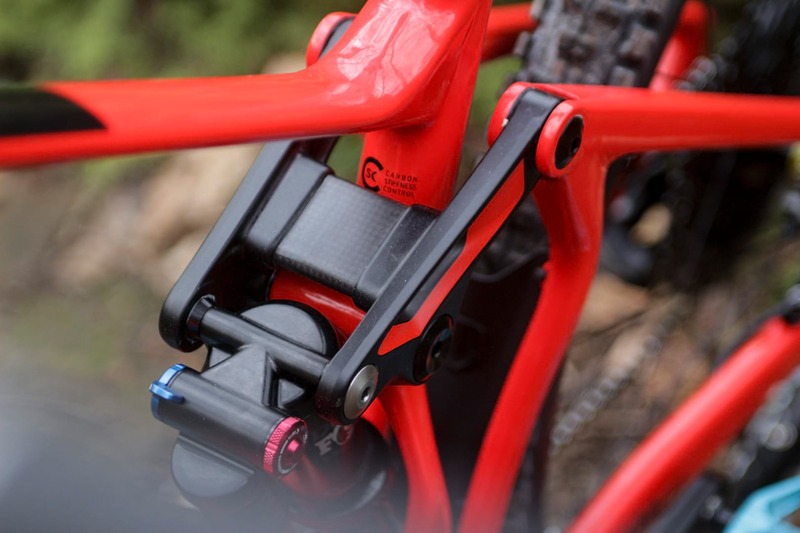 It would have been easy to add a set of mid-range 4 pot SRAM stoppers on the Foxy RR, and while they are good, I was super stoked to see a pair of XT on board. 1×12 gearing comes from the SRAM GX Eagle groupset but with a RaceFace crankset and 34t chainring. 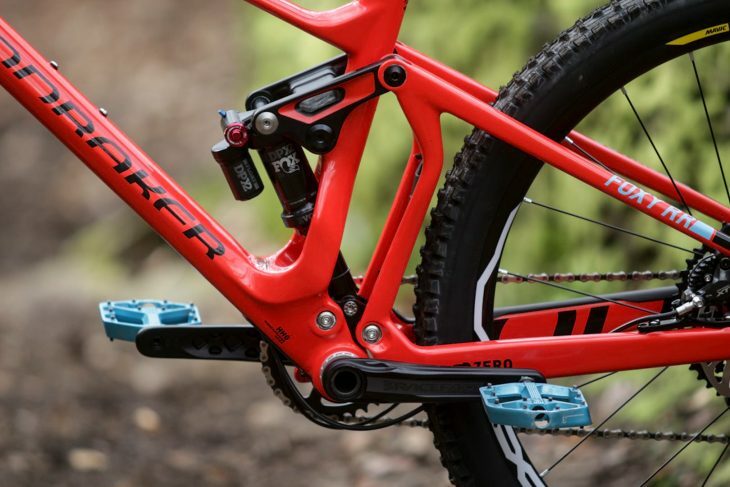 The Mondraker site lists a Truvativ crank as standard but even the official Mondraker image of the RR sports the same RaceFace crank as we have. I got on with the SDG Fly saddle. Last but not least is an SDG Fly saddle with steel rails, again another item I’m happy to see and one I get along with very very well. The Foxy climbs better than the geo might suggest. While the numbers make the Foxy sound huge and slack, the bike feels roomy but not stretched. It’s actually one of the comments people make when they sit on it, it doesn’t feel that long. With the first turn of the pedal, you feel the surge of acceleration from the back wheel and only with the slightest hint of pedal bob. Mondraker has designed a very efficient chassis with the Foxy, one that picks up speed well, maintains momentum and climbs better than the geometry suggests. In fact it climbs really really well. I found when climbing on the tarmac that the middle compression setting on the Fox rear shock was my preferred choice, but for off-road climbing, full-open is the way to go. The cleverly thought suspension sits in its sag position well and maintains a high level of grip. Even out of the saddle, uphill sprints are a joy on the Foxy, not at all what I was expecting. A long wheelbase offers stability and a ton of grip. 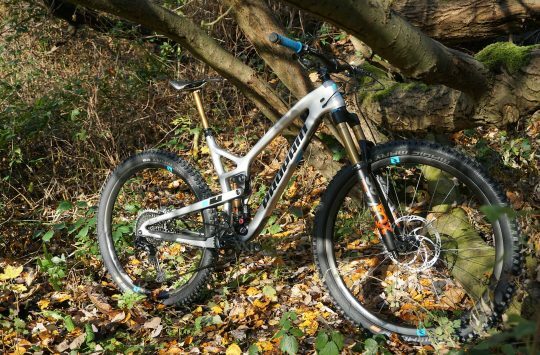 150mm of rear wheel travel is a good amount as it is, but Mondraker has made the Foxy feel like it boasts more. I put this down to the floating shock design which gives a limitless quality to the travel. Initially I considered adding a spacer to get a little more progression out of the rear end, but in the end, I left it as is which give a really good balance of bump absorption and liveliness. While being a new-school long, low and slack bike, the Foxy remains extremely agile. 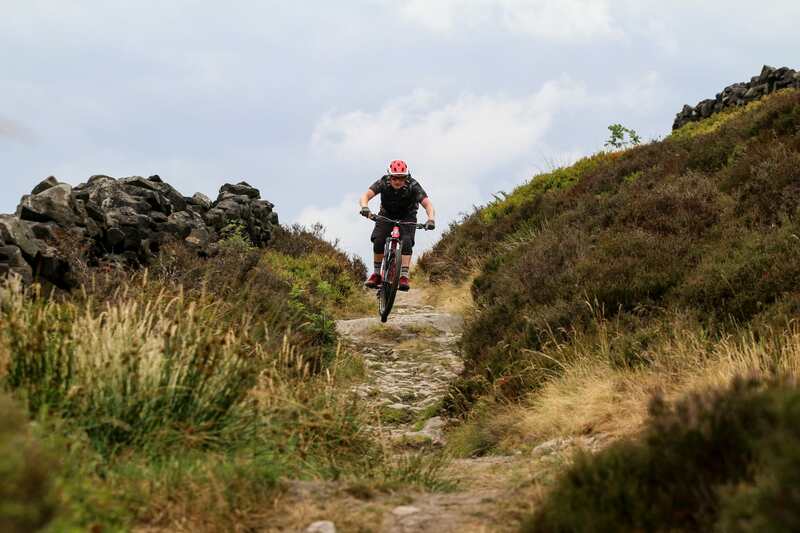 Hit a rock garden at a blistering pace thanks to the stability of the long wheelbase, then at the last moment using the agile handling to hop, skip, jump and smash, the rest of the way. The lightweight frame means the Foxy can be playful when you want it to be. Mondraker has really done a great job of the suspension on the Foxy, so much so that this is the bike that I’ve used to test various forks on including the 2019 Fox 36 Factory, and Motion Ride E18 linkage fork. Testing these forks also opened my eyes to the limits of the stock 34 too. 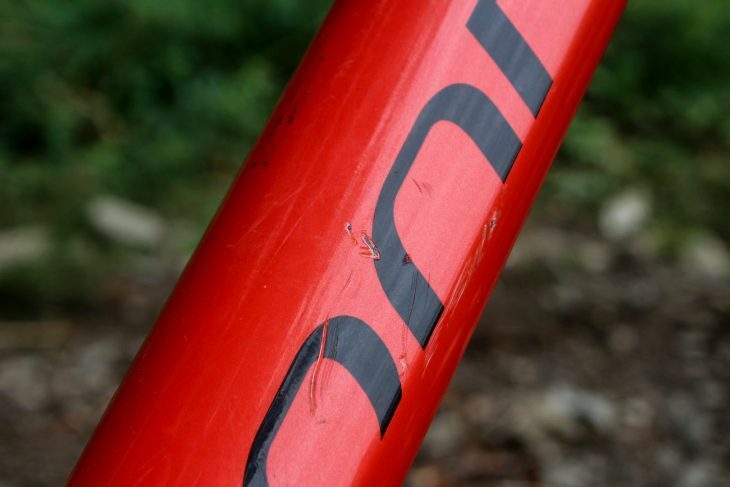 It’s a good mid-range fork, but a frame this good needs something better to really unlock its full potential. 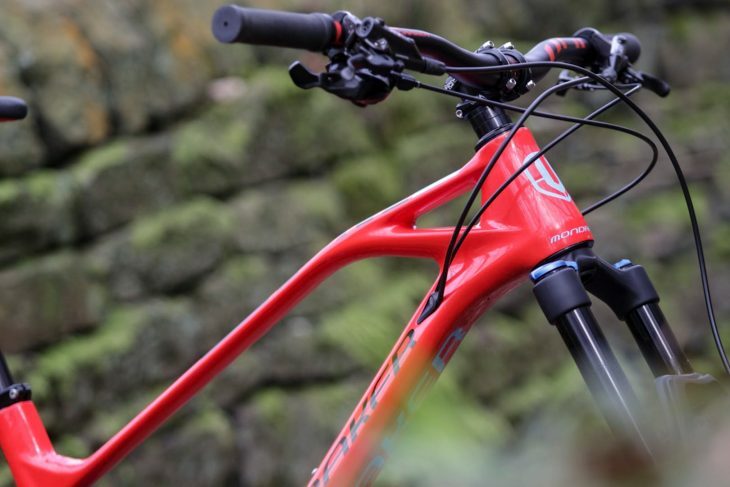 The frame and rear suspension warrant a better performing fork for the speed you’ll carry. Hitting any downslope the Mondraker’s acceleration and ability to gain momentum in the rough stuff is bested only by aggressive 29ers. The lightweight frame and sorted suspension love to be carved through berms and into rough chutes, and when you do make a mistake the stability afforded by the Forward Geometry gives you the time to turn a nasty tumble into an amazing save. The Foxy really came into its own on a trip to Mijas where I tested the long Spaniard on some incredible terrain including the SRAM test track. With bucket loads of grip, stability and my ever-growing confidence, blind runs were dispatched at speeds I wouldn’t ever have dreamt of previously. What’s incredible though is that this is a trail bike and the nimble Foxy feels just as composed and fun at your local trail centre, and because it’s so efficient and all day ride is achievable, fun and comfortable too. As I’ve already stated, most of the cost of this bike can be found in the frame. It’s as beautiful to ride as it is to look at. The bright red finish is also extremely hard wearing and continues to shine as well today as it did when it first arrived with us. There are a few scrapes here and there but these are from very big impacts. One issue I did have with the frame was the lower shock mount eventually worked its way loose. I’ve since tightened it and it has so far been OK. The only durability issues I’ve had were with the headset which disintegrated quickly but which was promptly warrantied, and a broken spoke in the rear wheel. Being a straight pull spoke it took some time for us to get hold of one. A nightmare in Todmorden, but imagine this had happened on a trip to the Alps. The Fox 34 is a good fork, but a 36 or Lyrik is really what the Foxy needs. The geometry is spot on. The Foxy is fast, fun and flickable, and it even climbs too! The quality of the frame is top-notch. Shimano XT Brakes were a very wise choice. I’ve ridden the Mondraker Foxy for five months now, so of course I feel at home with the bike, but after a just a few days on it I was already feeling really confident with it. Whereas other bikes I’ve tested have allowed me to ride faster and harder they’ve also shown their limits earlier. Climb up for another run. I’m still nowhere near the limits of what the Mondraker Foxy can handle, and I’ll likely never find them, but that’s great because it keeps pushing me to progress and step my riding up to the next level. That goes for all aspects of riding too, not just having fun on descents but even thrashing up climbs with a smile. 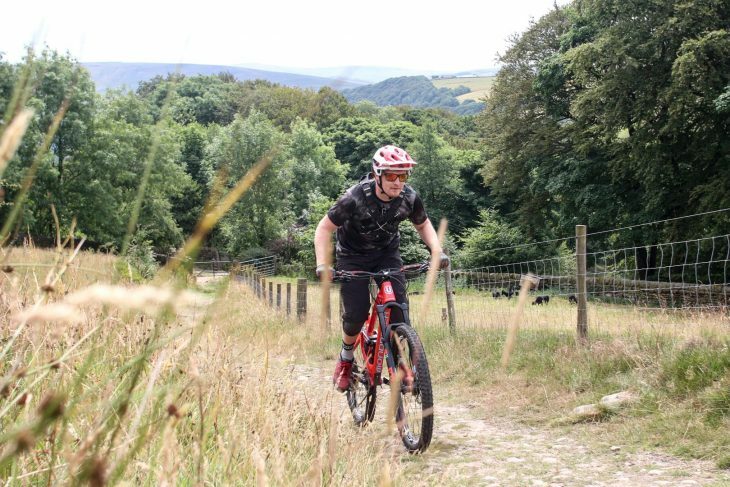 At £4499 the Foxy is an expensive bike, and I’ve had some issues with the spec, but if you’re after a long-term bike that will progress with your riding and never leave you wanting for more you’ll be hard pushed to beat it. 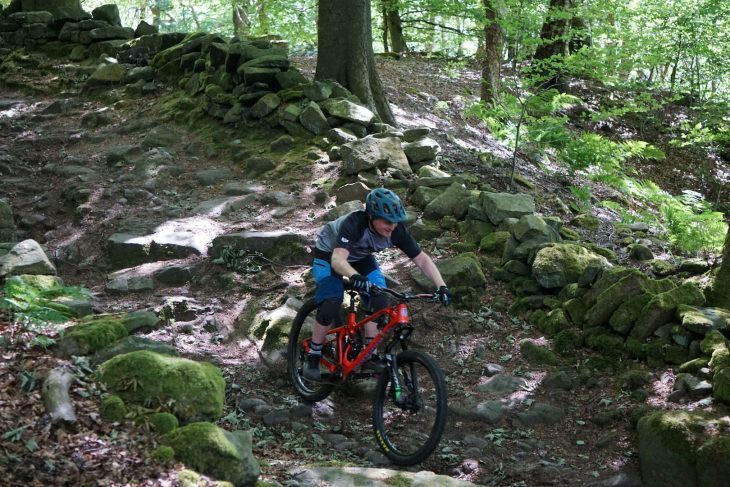 To those riders who think Mondraker’s Forward Geometry is only suitable for extreme riding situations, we suggest you get yourself booked on a Foxy test ride. Rims // Mavic XA 27.5, Tubeless Ready, internal width 25mm, asymmetrical rim, hookless, 24 spokes. Every Mondraker owner I’ve met has had these issues with shock bolts coming loose, going back years. Can’t understand why they haven’t sorted that out. I have the Aluminium XR with Fox 36s and its awesome to ride but keep an eye on those lower bolts, mine has just been back under warranty, it stripped the thread and needed helicoiling! I had a Dune (which is very similar to a foxy) back in 2012 and it was great in many ways but was too short and the bolts kept coming loose. It also seemed to have been made without the use of a ruler. Parts of the linkage just didn’t line up properly and had to be forced to com together. 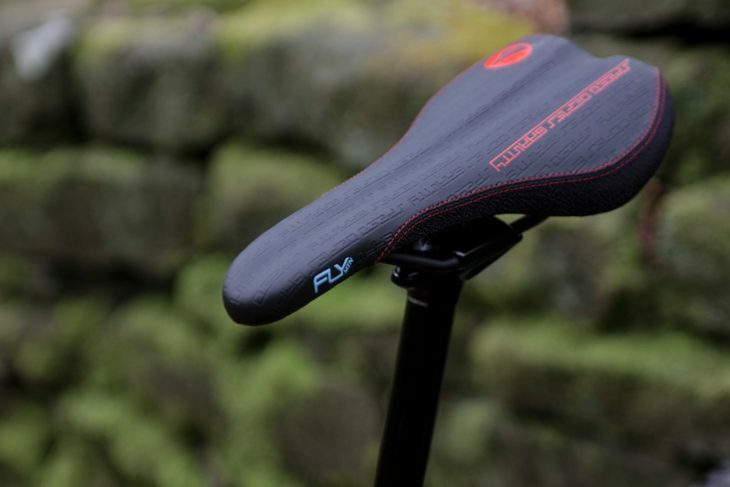 the seat tube had a mark from coming into contact with the seat stays on full travel and the air can had similar marks from not quite fitting inside the frame. It did look great and the suspension worked superb but I got rid of it pretty quickly. Then they solved the length issue but went massively ugly with the 10mm stem and humped top tube – urgh. But then last year I spotted the latest design – keeping the length but well and truly de-uglified ! I just bought a new frame – carbon to boot. Three weeks in and no issues so far – all of the bolts are still tight and the company seems to have invested in a ruler. Fingers crossed on this one!